Have you changed the formula of this lemonade? We bought one two weeks ago that tasted "wrong," but shrugged it off after we tried another container and it tasted fine. However, last week we got another one that tasted bad, and in a final attempt to find the original flavour, have actually bought a third one today which, it turns out, also tastes bad. The flavour is still tangy, but there's an artificial lemon flavour, like a sour candy, and it leaves a cloying, super-sweet aftertaste. The ingredients listed on the side of the package have not changed, however, the flavour is definitely different. At first, I thought it was my imagination, but we have now actually actually done a taste-test, and everybody could tell the difference (though our teenage son doesn't seem to mind the strongly artificial flavour of the "off" batches). 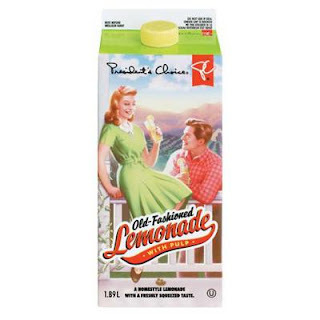 In any event, that is THREE packages of foul-tasting lemonade that we have purchased so far (I still have one package; let me know if you'd like the expiry date etc from that package), and I'd like to be refunded at least in part (I'm an optimist; I kept buying it, hoping the flavour would improve). I really hope to hear that this new taste is a fluke and that I can expect the flavour to return to normal in future, as this is one of my favourite PC products of all time!